As a result of limited secretariat resources, countries members of the Joint FAO/ECE/ILO Committee on Forest Technology, Management and Training, have taken the challenge to undertake more work themselves, by entrusting to Teams of Specialists several of its activities, especially those where specific expertise is required. The Team of Specialists on Forest Fire was created in the early 1980s and reorganized in 1993.The Team’s main task is to provide a critical link in communication and cooperation between fire scientists, managers and policy makers. The main activities embrace (1) the production of International Forest Fire News (IFFN) through the Global Fire Monitoring Center (GFMC); (2) organization of seminars; and (3) promotion of synergistic collaboration between governments, non-government institutions, and individuals, with emphasis on science and technology transfer, and support for developing fire management policies. The scope of the work of the Fire Team includes the countries belonging to the six Regional Wildland Fire Networks geographically located within the ECE region, as well as countries and Regional Wildland Fire Networks outside the ECE (for details on the UNISDR Global Wildland Fire Network and the six regional networks: see further down). Main emphasis of the work of the Team is in assisting countries of the Eastern Europe, Caucasus and Central Asia (EECCA) region in building national capacity in fire management, development of national policies and addressing the specific problems in the region, including transboundary cooperation in fire management. With this regional focus it is intended not to overlap with the ongoing work of the European Commission in the Western European part of the UNECE region, notably in the Mediterranean space (in conjunction with the Silva Mediterranea Fire Group) and the Fire Management Working Group of the North American Forestry Commission. However, the GFMC acting as Secretariat of the Global Wildland Fire Network and chair of the ToS ensures the continuing dialogue and cooperation between all regional wildland fire networks globally and exchange of information and cooperation with UN agencies and programmes as well as other international organizations contributing to global vegetation fire research, monitoring, assessment and capacity building in fire management (see also: UN Inter-Agency Cooperation and Coordination in Wildland Fire Management Including Key International Organizations. A Review by the Global Fire Monitoring Center). The work of the ToS will phased out by 31 July 2014 after it has successfully completed its mission. The Regional Wildland Fire Networks covering the UNECE Region (cf. 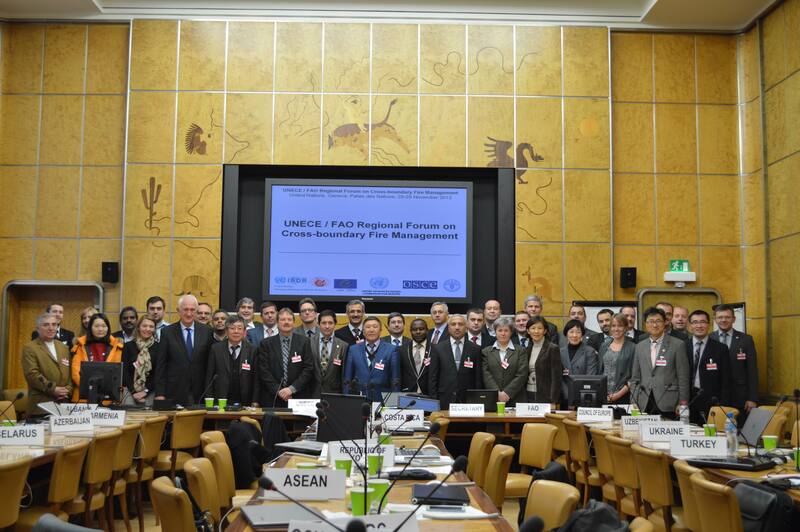 further below) will continue to represent the interests of UNECE Member States in the Global Wildland Fire Network and the Wildland Fire Advisory Group and its associated bodies and activities. In its final phase 2008-2014 the ToS was mandated, among other, to provide guidance to UNECE member States on forest fire management and forest fire policies, including on governance in bilateral and international cooperation. 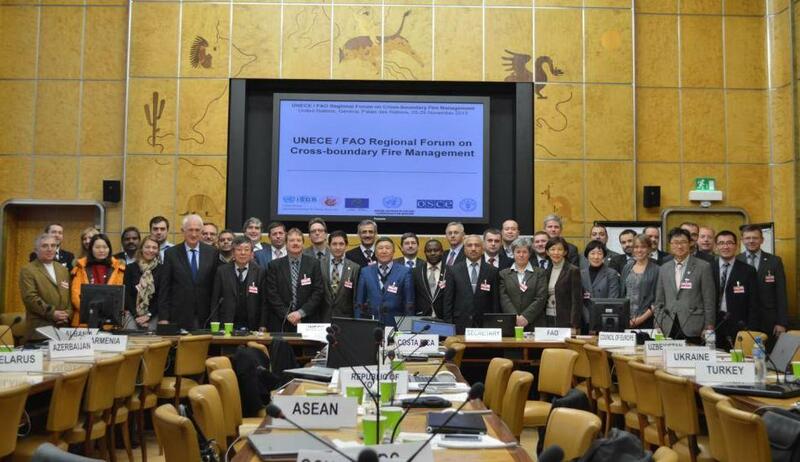 In cooperation with the UNECE-FAO Forestry and Timber Section, the GFMC prepared and facilitated the “UNECE/FAO Regional Forum on Cross-boundary Fire Management” (November, 2013), and followed-up on the recommendations of the Forum (January  July 2014). The Forum, which was sponsored by the German Federal Ministry for Food and Agriculture (BMEL), elaborated a number of recommendations addressing principles and envisaged international cooperation efforts in fire management.. Based on a UNECE-wide survey a, “Study on the contemporary and expected future forest fire issues in the UNECE region”, was developed as well as a White Paper on the State of Wildfires and Fire Management in Forests and other Vegetation Resources in the UNECE Region. In addition to recommendations, which addressed national and international governance in fire management, the GFMC supported by an international advisory group, prepared and recommended the international application of “International Fire Aviation Guidelines” and the “International Wildfire Preparedness Mechanism” (IWPM). International Forest Fire News (IFFN) is published bi-annually since 1988. It initiated a steadily increasing communication process in international fire matters. Since then IFFN provides an international information platform on which advances in fire research, technology and policy development are reported and disseminated. Until 2007 the printed version of IFFN has been subscribed by more than 1000 agencies, research laboratories and individuals all over the world. Starting with its 19th issue (August 1998) the IFFN are available on the website of the Global Fire Monitoring Center (GFMC). The website includes all past issues since 1990 which are organized in 80 country folders and several other special files. The production of IFFN since 2007 has been delayed and will be resumed as digital version only by the end of 2010. Regional Central Asian Forest Congress “Forest Policy: Problems and Solutions” (Bishkek, Kyrgyz Republic, 25-27 November 2004). In conjunction with and as a follow-up of the Antalya conference the Team of Specialists organized a forest fire exercise together with the host country Bulgaria in 2005. The next forest fire exercise was held in Armenia in 2011.